Yes, yes, I know: The Hunter Guy is baking muffins. Sorry (not sorry), but I’ve loved blueberry muffins for decades, especially toasted with butter. I ate lots of them when I ran the deli in the basement of the SUNY-Stony Brook student union, years ago. And since huckleberries are really just a West Coast variant of the blueberry, I decided to give this a go. Now I am sure there are all sorts of other blueberry muffin recipes out there, many of which are grand. This is an especially easy rendition — after all, I am mostly a savory cook, not a pastry chef. You don’t need a mixer for this recipe, just a spoon. Although a mixer helps if you do happen to have one. This recipe also makes about a dozen muffins. I say “about” because it all depends on how large you like your muffins; I like large ones, so I often only get nine per batch. Make them smaller if you want to be ensured of your dozen. I add sour cream to the mix, too, which not only keeps things moist but also adds a bit of tang, too. Use creme fraiche if you want to be fancy, or Greek yogurt if you have that lying around. Once made, these will keep for a few days in a covered container, which makes them good for road trips or hunting expeditions. And yes, of course you can use blueberries, too. This is an easy recipe that works with fresh or frozen huckleberries, blueberries or currants. I suppose it would work with blackberries or raspberries, but I haven't tried using them in this yet; if you do, let me know how it goes in the comments below. One tip: Make sure your baking powder is less than six months old. Old baking powder loses its leavening power, and you'll have flat, heavy leadmuffins instead of nice, light pretty muffins. Sometimes I substitute in 1/2 cup acorn flour for the wheat flour. This makes a browner, more rustic muffin that seems to keep for a few days' longer than the all-wheat muffins. Preheat the oven to 375°F and grease up a muffin pan. Beat the butter and sugar together until they are light and airy. Add the egg and beat to combine. Mix in the sour cream. Whisk together all the dry ingredients until they are well combined, then mix it into the wet ingredients. Don’t overwork the batter, which will be thick. You just want to get all the flour incorporated into everything. Fold in the huckleberries. 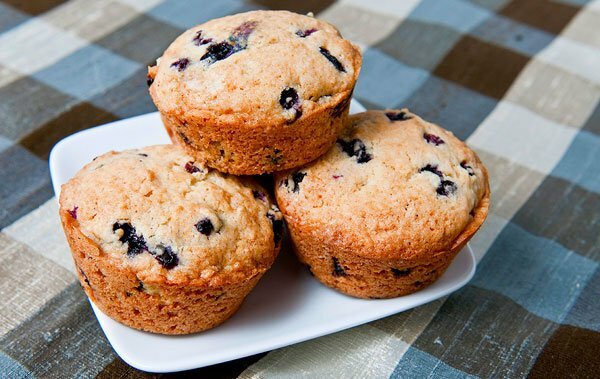 Do this in small batches so you have as few clumps of berries in your muffins as possible. You want to get them evenly distributed. 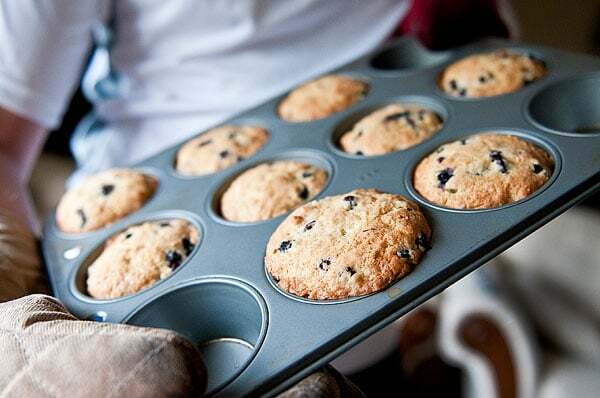 Use an ice cream scoop or large spoon to fill the muffin pan — only fill them 2/3 to 3/4 of the way, as the batter expands a lot in cooking. 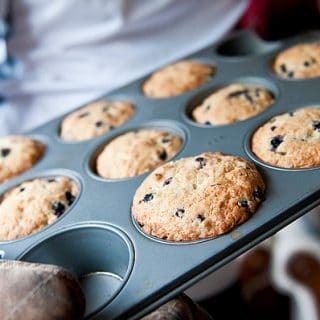 Bake for 20 to 30 minutes, or until you see a little browning, and when a toothpick jammed into a muffin comes out clean (not including blueberry juice). let them sit in the muffin tin for 5 minutes, then pop them onto a cooling rack. These are REALLY good. I took the advice of coating the berries in a little bit of flour but otherwise used the recipe exactly as described. I was worried the batter would be too thick and would smash all those lovely fresh berries but I was wrong. Totally delicious, thanks!